What began life as a making-of documentary for Terry Gilliam's take on the Don Quixote fable instead became a chronicle of the passion required to get a film from page to screen, and the heartbreak that comes when the many obstacles to said transition prevent the idea from reaching fruition. One of the few filmmakers active in cinema today who truly deserves the sobriquet “auteur”, Gilliam is known for making provocative and complex movies that garner buckets of praise from critics but not cash from audiences. One tends to either adore or detest Gilliam’s style, and how one feels about the director's unique vision is generally indicative of whether one is at all interested in viewing his films. If there ever was a director who could be said to tilt at windmills, it would be Terry Gilliam, making his filmed version of the well-known story of the Spanish nobleman who fancies himself a knight errant a serendipitous pairing of filmmaker and material. Unfortunately for the viewing public, Murphy seemed to be an uncredited co-executive producer on the project. Considering all the things that must happen at exactly the right time in exactly the right way in order for a movie to get from the idea stage to a completed project, it’s a wonder anything ever gets onto the screen at your local googolplex. And the documentary makers behind Lost in La Mancha capture that for audiences in minute detail. They also capture the reason why films actually do make it to home plate: Gilliam’s passion for the project never wavers, and his unwillingness to ever say die, even in the face of what is ultimately insurmountable disaster. The documentary cameras continue to roll even after the film being spotlighted has ceased to be, as the suits and the bean-counters figure out the cost in currency, and the audience sees the cost to the visionary who fought so hard to realize his dream on celluloid. 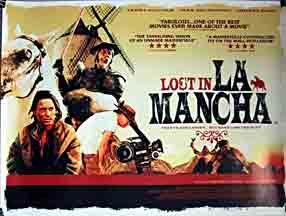 In addition to recording the fate of Gilliam’s film, Lost in La Mancha includes footage of Terry Gilliam’s storyboards, which come to animated life on-screen, as well as rushes from the six days that shooting actually occurred and screen tests by the leading actors. This footage gives a glimpse of what might have been, and provides the audience with a taste of why those who toil in this business called show endure the trials and tribulations that accompany even successful productions.